JIDDU KRISHNAMURTI GIVING HIS SPEECH IN 1929 DISSOLVING ‘THE ORDER OF THE STAR‘. The New Testament Book of the Gospel according to Matthew, Chapter 2, verse 1 and 2 describe the visit of the ‘Magi’. After Jesus was born in Bethlehem in Judea, during the time of King Herod, Magi from the east came to Jerusalem and asked, “Where is the one who has been born king of the Jews? We saw his STAR in the east and have come to worship him.” And verse 9 further states that after they had heard the king, they(Magi) went on their way, and the STAR they had seen in the east went ahead of them until it stopped over the place where the child was. When they saw the STAR, they were overjoyed. On coming to the house, they saw the child with his mother Mary, and they bowed down and worshiped him. ‘The Order of the Star’ was an organisation built around Jiddu Krishnamurti by Ms. Annie Besant and other Theosophists with the hope that he would be the vehicle for the return of the Christ or ‘MAITREYA’. ‘Truth is a pathless land’ was the speech made by Jiddu Krishnamurti in 1929 when he dissolved the Order of the Star. “I maintain that Truth is a pathless land, and you can not approach it by any path whatsoever, by any religion, by any sect. 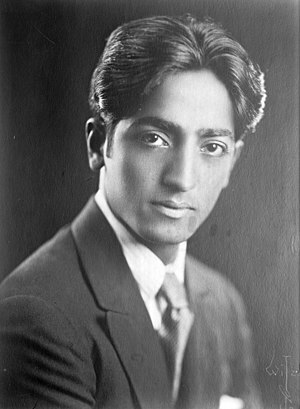 Truth, being limitless, unconditioned, unapproachable by any path whatsoever, cannot be organised; nor should any organisation be formed to lead or coerce people along any particular path.” Krishnamurti believed that the individual must establish his uniqueness, he should discover for himself that absolute, unconditioned Truth. The much traveled or a beaten path is recommended if you are aware of your destination. The beaten path provides the wayfarer a sense of security and comfort. In India, thinkers tend to believe that the principles underlying macrocosm(Universal) and microcosm(Individual) are related. According to Vedas which guide the Indian mind, the ‘BRAHMAN'( the Absolute Reality or ‘The Father’) cannot be known by any empirical means of knowledge. Socrates had stated that ‘ Know thyself, and you will know the universe and the gods ‘. In a similar manner Indian thinkers have always encouraged the values of introspection, to reflect upon your own mind and thoughts to understand self and self-knowledge is a tool, is the way and the path to the Truth. As an Indian, I always experience a sense of fear about the ‘Beaten Path’ and the assurance given by Jesus that He is the Way somehow does not dispel the sense of fear to travel on that path. I need an unbeaten path. S.S.L.C., Class of March, 1961.